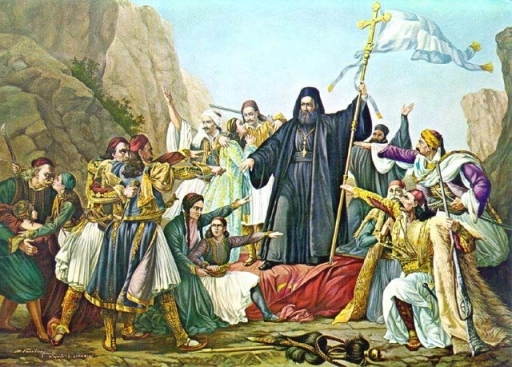 Germanos III of Old Patras raises the Independence banner. Painting by Ludovico Lipparini, Creative Commons. Americans may be familiar with the Greek Independence Day parade, celebrated throughout the States this time of the year. Even though the parade may take place any day between now and April, in Greece, it always falls on March 25th. To understand why this is such a big day for Greece, you need to keep in mind the date’s twin significance–religious and national. In 1453, Constantinople fell. The Ottomans swiftly conquered most of Greece. A number of rebellions failed to ensure self-determination for Greece. This was a long-standing demand, as Greeks had revolted four times against the Byzantine Empire as well, seeing it as a continuation of the Roman occupation (it was only later that the Empire was Hellenized, finally stopping the revolts). 1821 saw the start of the rebellion that led to the modern Greek state. 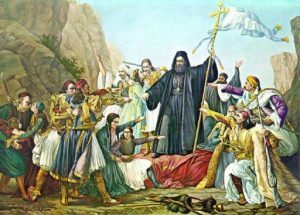 The date most people have associated with it is March 25th, to coincide with the Feast of the Annunciation, when Bishop Germanos III raised the revolutionary banner in Patras. Annunciation (1475–1480), Uffizi, is thought to be Leonardo da Vinci’s earliest complete work. Creative Commons. The Feast of the Annunciation is one of the twelve “Great Feasts” of the liturgical year, and is among the eight of them that are counted as “feasts of the Lord”. It is celebrated by the Greek Church, along with Eastern Orthodox, Eastern Catholic, and Oriental Orthodox Churches. As the action initiating the Incarnation of Christ, Annunciation has such an important place in Orthodox Christian theology that the festal Divine Liturgy of St. John Chrysostom is always celebrated on the feast, even if it falls on Great and Holy Friday, the day when the crucifixion of Jesus is remembered. If the Annunciation falls on Easter Sunday itself, then it is celebrated jointly with the Resurrection. 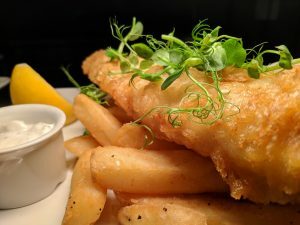 Despite the fact that it usually falls smack in the middle of Lent (Sarakosti), the 40-day fasting period leading to Easter, the traditional Annunciation dish is fried cod, served with a garlic-based dip. This tradition dates back to the 15th century, when salted cod was introduced to Greece, solving a practical problem: yes, the Church allowed fish to be consumed on the Annunciation. However, fresh fish could be hard to get unless you lived by the sea. Mountainous regions, in particular, had virtually no access to it. The introduction of salted cod allowed fish to be transferred anywhere, no matter how far from the sea, and pretty soon everyone was having it for the Annunciation feast–especially given its low price. Thus, a tradition was born. So, next time you find yourself in Greece on March 25th, get ready for a lot of parades… and plenty of garlic breath! Thanks for sharing this information, Nicholas. I would have loved to have seen that. It lends a certain degree of importance and solemnity to the Mass. I did not know that the Feast of the Annunciation marked the start of the Greek Independence movement in 1821. The Feast is celebrated by Anglo-Catholic Anglicans as well. Oxford Movement poet John Keble wrote a beautiful poem about the day. Thanks for that, Christopher! Where can I find the poem? If you Google The Christian Year by John Keble, a Gutenberg free file appears. Keble wrote poems for every day of the Christian Year on the Church calendar starting with the First Sunday In Advent and then ending with the Sunday Before Advent for the next year. His poem for The Feast of the Annunciation is found for that date on the Church calendar.